Post-Surgical/Recovery Bra and Binder in one. Comfortable & Breathable - 24/7 Wearability - You can wear your Hugger 24/7 for extended periods of time - tested up to 19 days without washing it. Due to the antibacterial yarn many wearers have worn the Hugger for 3 - 5 days post-surgically without washing. Antibacterial & Durable - The high performance yarn used to make your Hugger effectively reduces the growth of bacteria (found most commonly in human perspiration) with 99.9% effectiveness, tested up to 50 washes. Now, what makes the yarn antibacterial? An antibacterial additive is actually embedded into the fiber (not added or coated onto a finished garment) so the yarn retains it's bacteria fighting properties through numerous washes. You can wear your Hugger 24/7 for extended periods of time - tested up to 19 days without washing it. We recommend washing your Hugger as little or as much as you feel you need to. Keep in mind, the antibacterial, high performance yarn in your Hugger will keep your Hugger smelling and feeling fresh so no need to wash excessively. Many Hugger wearers have worn their Huggers 24/7 for 3 – 5 days post-surgically without washing. Developed with Surgeons and Technical Design Experts to create a body friendly, effective, durable and affordable compression bra and binder in one. Upsize one size for extra comfort. Upsize one size if you are a D+ cup for a less compressive fit. Great for exercise if you are a D+cup. 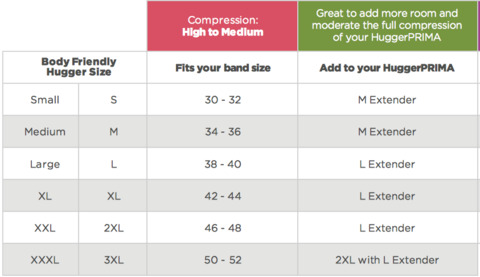 Add a HuggerEXTENDER for reduced compression.